Deconstructed sushi is easy and delicious! 2 fillets salmon (can use lightly smoked for more flavour) or you can buy ready cooked. Prepare 2 cups sushi rice with 2 cups of cold water in a pan. Heat on high light until water bubbles, then turn on low and cover with a lid for 12 minutes. Turn it off and leave to stand with the lid on for 15 minutes. Meanwhile, heat 1 tsp salt, 5 tbsp rice vinegar and 1 tbsp sugar on medium heat until dissolved (about one minute). Arrange rice in a serving dish. Pour over the vinegar solution. Wash salmon, drizzle with 2 tbsp lemon juice and black pepper and put in oven uncovered on 190°C for 15 minutes. Flake salmon whilst warm over the rice. 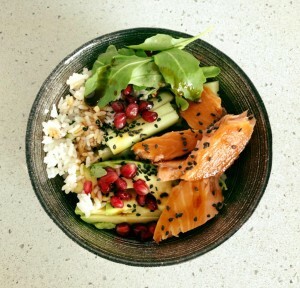 Add the cucumber batons, avocado cubes, rocket leaves to the rice and salmon. Fold over the seaweed 4/5 times and snip (with scissors) very fine shreds all over the salad. Top with black sesame seeds if they agree with you. Notes: You can adjust this according to what vegetables agree with you. You can use roasted sweet potatoes (cubed, drizzled with 1 tbsp oil and 1 tbsp honey and roasted uncovered for 40 minutes on 180°C). Shredded carrots are also lovely in this salad but not everyone can tolerate them. Pomegranate seeds make a pretty topping!